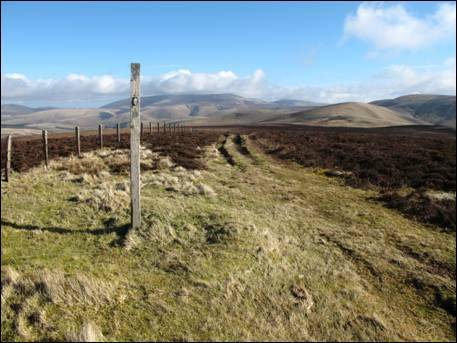 England`s most famous long distance footpath crosses mile after mile of Northumberland`s wild and empty Cheviot Hills as it winds its way over the final leg of an epic journey along England`s spine. 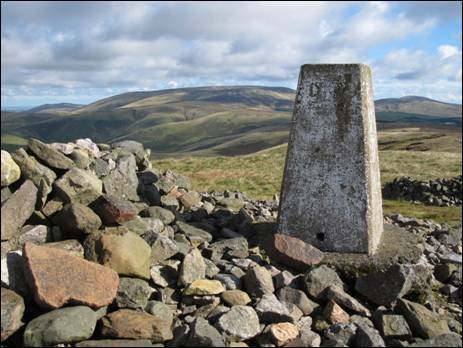 This walk will take you from the upper reaches of the River Coquet onto the border ridge where you will join the Pennine Way for four undulating miles over the high ground of Lamb Hill, Beefstand Hill, Mozie Law and the iconic Windy Gyle. 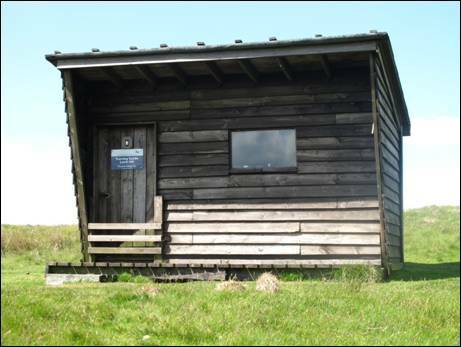 You will experience far distant views over seemingly endless hill country on both sides of the Anglo-Scottish border as clouds billow above you against a backcloth of blue sky. 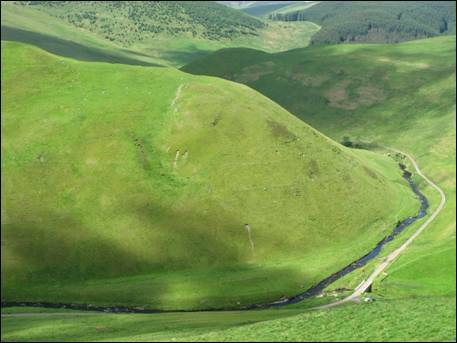 You will end the day visiting two smaller subsidiary hills as you descend gently back to beautiful Upper Coquetdale. Be prepared for a fistful of spectacular views. 1. 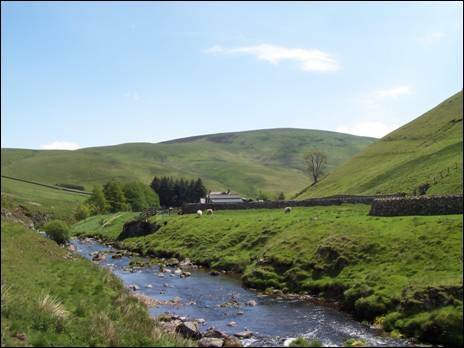 Where the Rowhope Burn enters the delightful River Coquet, 6 miles along the twisting single track road from Alwinton, there is limited parking. Close by, in the 18th century, stood the Slymefoot public house, by all accounts a den of iniquity, where during the winter months the local sheep farmers spent their time gambling and drinking illicit whisky while their shepherds came in every day to receive their orders and to carry the news. Cross the bridge and then the stile next to the five bar gate to your right and follow the track steeply ahead, signposted “ Border Ridge 3 miles “. 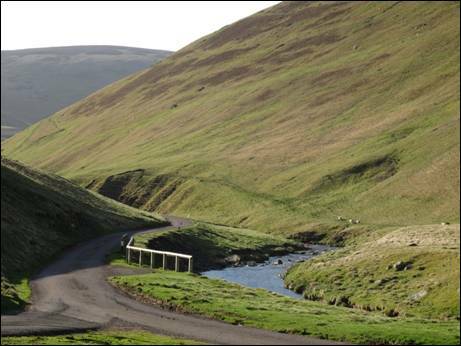 This is `the Street`, an ancient high level drove road, shown on General Roy`s 1775 map as `the Clattering Path`, which runs from Upper Coquetdale over Black Braes and the border to Hownam in the Kale Water Valley. At the top of the hill cross the stile to your left and take the green track which heads initially westwards away from the fence hugging bridleway to your right. After turning northwards and gently climbing uphill the track soon joins another bridleway (NT 849116) which you follow westwards across the southern flanks of Hindside Knowe. There are excellent views down into the narrow Coquet Valley below. Head for the tree shrouded buildings of Carlcroft farm and, on reaching the Carlcroft Burn, cross over the footbridge and follow the track as it turns behind and climbs away from the buildings. 2. The track rises across the upper slopes of Carlcroft Hill before descending gently to cross the Blind Burn near to a fine circular sheep stell (NT 820127). This is a delightful spot with the ruins of the grandly named former shepherd`s cottage Yearning Hall visible to the west. The path away from the burn is faint in places but is marked occasionally by finger posts, so be sure to keep your eyes peeled for these as you cross a fine stretch of mat grass. These areas of grass are known locally as `Whitelands` because the erect spikes that are produced by the grass in June become bleached to almost white as autumn approaches. Eventually, the path merges with a clearer green track arriving from Yearning Law and you continue with this until you reach the mountain refuge hut at Yearning Saddle (NT 804129) on the border ridge. This is an ideal spot to take a short break. You are now on the Pennine Way as it traverses the high ground of the Cheviot Hills all the way to the quiet Scottish border town of Kirk Yetholm. When Tom Stephenson first proposed the Way in 1935 he rated the Cheviot Hills as his favourite walking area in the country. Many of the wettest sections across these lonely hills have now been paved with stone slabs taken from derelict Yorkshire cotton mills. Your route now heads north eastwards with the border fence, on your left, for company, first to the trig point on Lamb Hill and then to the undistinguished tops of Beefstand Hill and Mozie Law. You will feel an intense sense of isolation as you see wave after wave of foothills rolling away on either side of you, blocking out all sign of habitation. If you are lucky you will see the shy feral goats that have roamed these hills for many years and if you are downwind you will more than likely catch their pungent scent. 3. Towards the bottom of the descent of Mozie Law you will encounter a stile (NT 835149) and, once over, you are again on `the Street`. Cross over this track, leaving the border fence for a short while, and continue in a north easterly direction over fairly rough ground and the appropriately named Foul Step, to the climb towards Windy Rig. Pause as you reach the highest point of this stretch to admire the view straight down the Rowhope Valley, one of the finest views the Cheviot Hills has to offer. Also spare a thought for the four RAF airmen who died near here on the 17 th March 1940 when their Handley Page Hampden aircraft crashed after having overflown its base at RAF Waddington in Lincolnshire. You now descend over a grassy col before commencing the climb to the summit of Windy Gyle, the highest point of this walk. When you reach the stile, cross over into Scotland, and continue over initially steep ground to the giant cairn on the top of the fourth highest of the Cheviot Hills. This is a Bronze Age burial cairn known as Russell`s Cairn, so named to commemorate Lord Francis Russell who was killed near here in 1585 at a meeting of the Wardens of the Marches. The views are extensive in all directions. 4. You must now leave the Pennine Way and the higher ground to head south easterly from the summit cairn, over the stile, and then downhill towards Scotchman`s Ford (NT 861148). Once reached, continue along a grassy quad track in the same general direction, towards the 495 metre top of Little Ward Law. This requires a small diversion from the main track. On leaving the top you will need to rejoin the track, which in a short while will turn to head southwards, to meet the gravel road leading ultimately to the remote farm of Uswayford. It is not unknown, during severe winters, for this farm to be cut off for weeks at a time. Deep in the plantation on the other side of the track is the mysteriously named Murder Cleugh, hinting s at some distant dark and deadly event. Turn right along the gravel road until you reach the end of the plantation and the stile on your left (NT 868131). Cross over the stile and, if you look carefully, you will see a small headstone just inside the boundary of the plantation bearing the words, `Murder Cleugh Here in 1610 Robert Lumsden killed Isabella Sudden`. Proceed along the waymarked green bridleway over relatively flat ground with the rounded top of Barrow Law ahead of you. On reaching the white topped waymarker on the flanks of Barrow Law take the faint quad track, to your right, which heads uphill to the 419 metre summit (NT 863116). This is a tremendous vantage point, looking down to the twisting River Coquet below and dominated to the south east by the huge bulk of Shillhope Law. 5. After taking time to admire the view, head south easterly across the flat summit and continue downhill in the direction of the obvious Meadow Sike. Before reaching the sike (NT 866114) you will join the up raised line of a sod dyke named after a long forgotten character from these parts called Richard the Crossbowman which heads steeply and directly towards the valley road near to the farmstead of Windyhaugh on the other side of the river. Once down in the valley turn right and follow the road and the river easily back to Slymefoot and the end of a delightful day`s walk. Some steep ascents and descents over mixed terrain with many boggy sections paved with mill stone slabs. Some green tracks and one short stretches of tarmac.